A forum for shoot-em-up game developers. Post your finished games or work-in-progress here. Hey everyone, new to the forum, but a long time fan of shooters. Literally walked miles in the snow as a kid to play Tatsujin (Truxton) at my local. I want to share my new (intentionally bubble-gummy / casual-ish) game Dragon Vs. Orcs. Please pardon the excessively markety imagery, it's all my graphics I made for the app stores (which need to be stupidly, excessively, markety, puke). I make games for a living and I'm doing independent hustle nowadays and it has been forever since I made a shmup so I wanted to create a framework that I could build a series of shooters on. I wanted to try something completely different so I started in 3D and after experimenting with a few fixed cameras, I came up with this rotating camera system that feels dynamic and compelling (to me), but still supports simple one touch sliding. I got inspired by some shooter/rpgs that prioritize a collect mechanic as high as shooting and dodging. I felt this could be a fun space to explore for mobile where you sometimes want a little lighter level of engagement than the really tense mindest that some bullethell shooters require. I love them all, I just wanted to try something really really really light and fluffy. I intentionally picked a theme the opposite of what I usually want in a shooter. I used cartoon dragons for players, and a set of combat orcs (all range combat, throwing axes) for enemies. Everything is presented in a pastel, gum-ball candy aesthetic, and the soundtrack is a background 'radio-player' of synthwave tracks. The game focuses on the collect mechanic that fills the power meter, that releases power-up pickups when it's full. 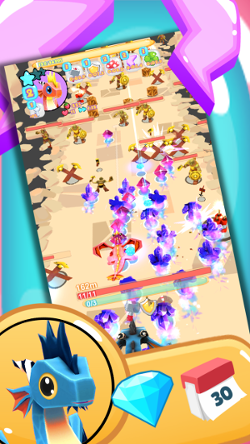 The power gems that you collect are spawned from destroying enemy projectiles, destructibles, and enemies themselves. Early on in a run, it only takes 2 gems to fill the power meter, but the further you go, the more gems it takes. 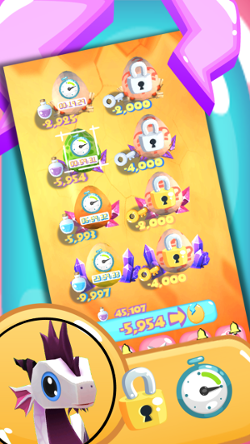 So you get a quick, dazzling experience with lots of power ups immediately when you start a run, then it gets more tense and clutch as the run goes further and you really need grab every power gem to build that meter slowly. My intention was to make something that anyone can have a quick, fun blast with, but shmup/rpg players would find the deeper harder long game. 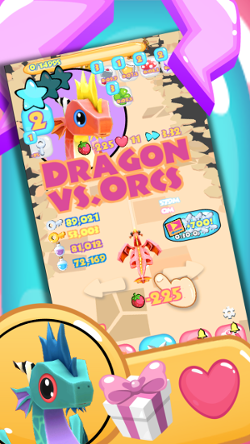 The type of power-ups that get spawned are determined by the types of powers each dragon has. Each dragon has an assortment of different powers and overall number of them. As well, each dragon has a different assortment (and number) of collect buffs. 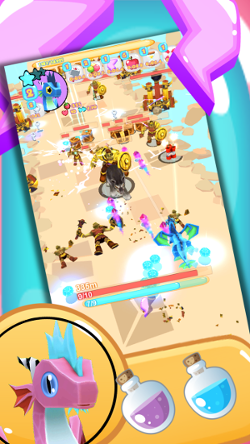 Collect buffs determine if extra currency pickups will randomly spawn when you destroy enemy projectiles, enemies, and destructibles. 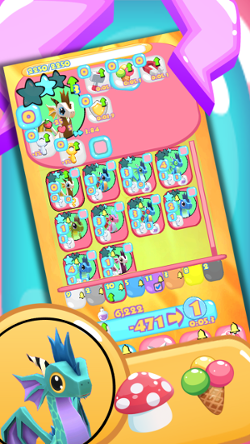 The currencies are all required for various unlocking and upgrading in the game. Dragons are divided into 3 classes (small, medium, large: represented by the size of the star in their profile). Small are faster and have less health, large are slower and have more health). Also, dragons are divided into 8 classes (represented by the color behind their profile pic). Lower classes have less powers and buffs, higher classes have more powers and more buffs (and higher level buffs). Lower classes also have lower power duration ranges and buff pickup chances. You can hatch new dragons (cheaper for lower rank, more expensive for higher rank). They spawn randomly leveled up from 0-3. Taking dragons into battle gains them experience. As the XP threshold is reached, the dragon unlocks 3 upgrades. 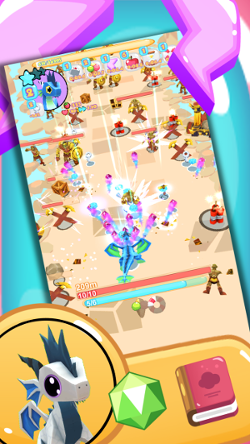 Dragon powers and buffs can be upgraded (all from level 0 to 10 affecting power duration for powers and chance to spawn for buffs). Higher ranking dragons aren't necessarily "better" than lower ranking dragons. They run with more active powers and longer durations, but it's also equally fun to run with a dragon with only 2 powers since those 2 will be the only ones spawning creating fun over powered situations. Similarly the large classes aren't necessarily "better" than the small classes, just different. It's fun to run really fast and have quick tense runs with small dragons, and it's fun to use larger dragons to maximize loot harvesting. I'm experimenting with a widescreen view for a desktop port. I may put it up on itch.io for ~$5 but only if I can figure out a way to rebalance the game without ads and in-app purchases. Maybe just give you like 1million of every currency or something and call it a day? Here's a test video of widescreen HD. Anyway, thanks for looking. I'm hoping to re-skin / re-theme this framework a few different ways now and let it evolve. We'll see. It's available for Android now on Google Play. If it makes a hundred bucks I'll re-enroll my Apple developer account and put it up on the App Store. Take a look at Sky Force Reloaded on Steam (https://store.steampowered.com/app/6676 ... _Reloaded/) for a great example of porting a mobile shmup to widescreen PC. They have an in-game currency collection system that encourages replay to power-up your planes gradually. Thanks so much for the link help! Good suggestion on Sky Force also, thanks. I have some ideas. There are a couple timers that can go away, that would reduce 2 sinks on 2 currencies. I could increase the currency pickups spawn chance ranges. Stuff like that to rebalance currency income to make collecting sufficiently effective without IAP. Could probably add a challenge system to add another income source also. There are possibilities. I'm stripping down the project to use it as a starting point for variations. Something aimed at PC from the get-go would probably be better overall (though I'll still try to port this). Good on you for combining those two genres. It's something many purists frown on, and it can create all kinds of crazy dev challenges in terms of getting the flow and balance of the game right (I've been there myself! ), but I think when done properly, it's a fantastic combination. I agree that Skyforce is a great example of how to convert from vertical to wide screen mode, though there is some sacrifice - personally I much prefer it on a vertical screen, because you have more of a sense of 'exploring' the screen from left to right, with extra parallax, and more of a dynamic psychological sense of moving forward (up, vertical). So the book is not closed on that topic! Maybe you can come up with an original solution yourself? In my game 'Cosmonator' (which is also a vertical scrolling RPG/shmup mixup), we simply created dashboard graphics to fill the sides of the screen, but that's a lazy solution (and one adopted for years by danmaku games, often to horrible effect with stupid sleazy anime chicks in the margins). And Cosmonator isn't even made for mobile phones - PC is our main platform. We just liked those old school vertical arcade shooters I guess. So if you come up with a cool solution, I want to know about it! I see that 'Drone Swarm', the product used as an example by our helpful administrator on this site (monoRAIL), has an interesting solution that you don't see often - making a vertical scrolling shooter but tilting it sideways, so it's a bit like Gradius, but still top down. Seems pretty obvious, and looks quite efficient actually; when I first saw it seemed really weird but I guess that's just because it's so unusual. Maybe one could make an option to just tilt all the in game graphics 90 degrees like that and leave it to the player to decide what they prefer? Oh, and concerning Skyforce's reward system and replayability - my opinion - it's a great system for the most part, especially since each level has several different challenges to clock (so you have to approach it differently in order to complete it in different ways), but be careful not to get too inspired! They do it to such an extent that it becomes quite grindy eventually, because you have to play the same levels over and over and over and over. A bit of that is fine, in the RPG sense of it, but if you don't have any randomized roguelike elements in your game, different randomized levels or weapons or abilities, etc (all staples of most modern RPGs, think Diablo), then too much forced replayability will make some players put down your game for good. 'My intention was to make something that anyone can have a quick, fun blast with, but shmup/rpg players would find the deeper harder long game.' - That is a really solid approach. I wish you all the best, and I'll follow your project!